The Quarters at Lake George offers luxury townhouse vacation rentals at their beautiful resort overlooking Lake George. Historically, most travelers were coming to The Quarters’ website from Referral sites. With the redesigned, Modern SEO friendly website, however, most travelers are coming to the website by finding The Quarters at Lake George in the organic search results. 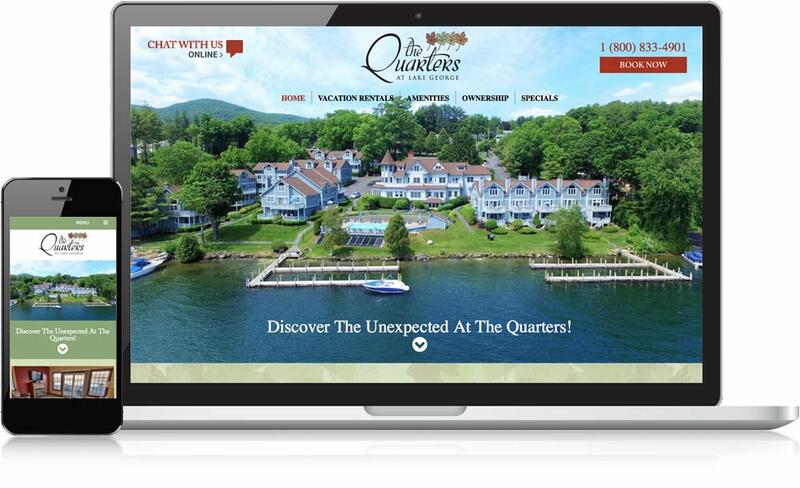 Mannix Marketing created an SEO friendly, attention-grabbing lodging website and ran a targeted online advertising program through LakeGeorge.com to help The Quarters at Lake George achieve their goals. Results were amazing with 14% More Organic Search Traffic and 30% More traffic from Lake George.com. By running a targeted online advertising program through LakeGeorge.com, The Quarters at Lake George is able to reach more prospective guests who are searching for resorts in Lake George, NY and attract them to the website. We have been working with Mannix Marketing for quite some time redesigning our website. The staff has been a pleasure to work with and has helped us with any questions or concerns along the way. The website turned out wonderful and we are very happy with the finished product!